One of four Nisga'a communities, the seaside village of Gingolx is located on the northwest coast of British Columbia on Portland Inlet, approximately 170 kilometers northwest of Terrace. Home to approximately 500 residents, Gingolx offers rich cultural history, natural beauty, and some of North America's finest seafood. The people of Gingolx have an elemental relationship with the sea. For countless generations, we have relied on the harvest of salmon, crab, halibut, snapper, and shellfish. Isolated from the outside world until 2002, Gingolx is now connected to the North American road network with the completion of the Nisga'a Highway 113 extension. Gingolx means "place of skulls," a historic warning to would-be conquerors that we are determined to protect and preserve our land, resources, and traditional way of life. Today, Gingolx is famous for its hospitality and welcomes visitors from around the world. With panoramic view of Portland Inlet, residents of Gingolx live in tune with the seasons and the tide. Forming the mouth of the Nass River, Portland Inlet sees the annual migration of five species of wild Pacific salmon and oolichan, a fingers-sized member of the smelt family. Gingolx offers a public boat launch that leads to some of the best kayaking, boating, and sport fishing in North America. Each summer, thousands of visitors arrive for Crabfest, an annual celebration of music, seafood, and Nisga'a hospitality. Nisga'a Highway 113 paves the way for ease of access to Gingolx and offers breathtaking views of the Nass River estuary and wildlife. Once in Gingolx, visit our tribal smoke houses and watch the preparation of traditional foods. Stop by our cultural longhouse and carving shed to watch Nisga'a carvers at work. Explore surrounding bays and inlets aboard the Spirit of Gingolx or take part in a cultural event featuring traditional Nisga'a singing, dancing, and a seafood feast. If you want to take in things in a more relaxed manner, enjoy a stroll around the seawall and breathe in some of the freshest air in the world. Gingolx is serviced by local stores. Bed & Breakfast accommodation is available in Gingolx and other Nisga'a villages and campsites are located near the village. One of four Nisga'a communities, Gitwinksihlkw is located on the north bank of the Nass River 100 kilometres northwest of Terrace, British Columbia. Home to 250 residents, Gitwinksihlkw offers cultural rich history, natural beauty, and access to Canada's newest lava bed. Canada's last volcanic eruption occurred in Nisga'a territory approximately 250 years ago. The lava destroyed everything in its path, sparked fires in the surrounding forests, and covered two Nisga'a villages. More than 2,000 people perished. Survivors eventually resettled Gitwinksihlkw (Place of the Lizards). According to oral tradition, large lizards lived here before the eruption. Today, the lizards are gone but the vast lava beds still dominate the valley. They serve as a memorial to those who lost their lives and as a reminder of the importance of respect-for both the natural world and the wisdom of the elders. Situated at the edge of the Nass River and Anhluut'ukwsim Laxmihl Angwinga'asanskwhl (Nisga'a Memorial Lava Bed Park), Gitwinksihlkw enjoys one of British Columbia's most dramatic natural settings. Nisga'a Highway 113 paves the way for ease of access to our village and each year, the number of visitors continues to grow. Nisga'a Memorial Lava Bed Park is a popular destination with a 16 site campground and a Visitors Centre displaying Nisga'a artifacts (open July and August). Join us for guided tours of the lava beds, sport fishing, backcountry excursions, a stroll across the Nass River on a 400-foot long extension bridge, or simply stop and admire our majestic pts'aan (totem poles) that tell of Nisga'a history, culture, and clan relationships. Be sure to stop by Nass Bridges Tourist Information Centre and Gift Shop. Local stores serve the community and Bed & Breakfast accommodation is available in Gitwinksihlkw and other villages. One of four Nisga'a communities, the village of Laxgalts'ap is located on the Nass River estuary, approximately 150 kilometers north of Terrace. Home to approximately 520 residents, Laxgalts'ap offers rich cultural history, natural beauty, and world-class fishing. 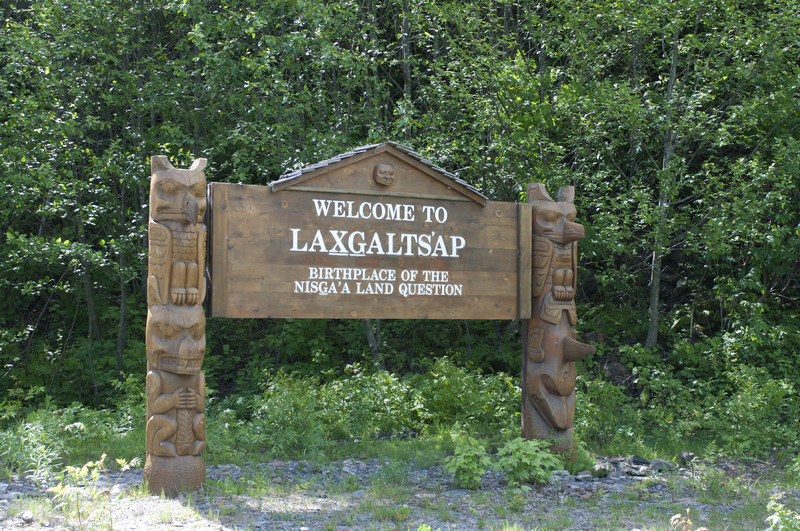 Laxgalts'ap means "village on village," an acknowledgement that the current village is built on a series of Nisga'a communities that have occupied this site for millennia. Laxgalts'ap is located in the Nass River estuary, the spawning grounds of five species of wild Pacific salmon and oolichan, a finger-sized member of the smelt family. Each year, tons of oolichan are harvested in Fishery Bay and rendered into precious oil-a historic staple of Nisga'a trade and a valuable commodity that supplied the Northwest Coast's famous "Grease Trail." For countless generations, we have relied on the harvest of fish and seafood and most of our homes have a traditional smoke house and/or drying racks to preserve and the bounty of the river and sea. Laxgalts'ap is located in a temperate coastal rainforest in the scenic Nass Valley. The region abounds with wildlife, including: bald eagles, moose, grizzly and black bears, and even the elusive Kermode or "spirit" bear (white color subspecies of black bear). Nisga'a Highway 113 paves the way for ease of access to Laxgalts'ap and each year, the number of visitors continues to grow. Join us for Hobiiyee (Nisga'a New Year) celebrations when the oolichan return, or anytime during our mild summers or falls. Laxgalts'ap offers a public boat launch that leads to some of the best sport fishing in North America. Four local stores serve the community and Bed & Breakfast accommodation is available in Laxgalts'ap and other Nisga'a villages. One of four Nisga'a communities, Gitlaxt'aamiks (formerly New Aiyansh) is located 97 kilometres northwest of Terrace, British Columbia. Home to approximately 1,800 residents, Gitlaxt'aamiks offers rich cultural history, natural beauty, and central location for exploring Nisga'a Lands. Gitlaxt'aamiks was a large and ancient village on the north bank of the Nass River on the edge of the historic Grease Trail. In 1883, a missionary established a Christian village about six kilometers downriver. There, Nisga'a craftsmen built a large village complete with Victorian style houses, a church, community hall, school, sawmill, and its own printing press. They called this new village Aiyansh (Fertile Valley). After a series of floods, the people of Aiyansh finally moved to higher ground on the other side of the river and established New Aiyansh. It was here-after seeking a settlement for 113 years-Nisga'a negotiators signed British Columbia's first modern treaty, the Nisga'a Final Agreement. In the spring of 2010 the village government voted to rename the village of New Aiyansh Gitlaxt'aamiks. Gitlaxt'aamiks offers an ideal launching point for discovery of Nisga'a Lands and culture. In 1977, the "Unity Pole" was raised here-the first new pts'aan (totem pole) in the Nass Valley in a century. It signaled a rebirth of Nisga'a art, culture, and language, as well as a renewed commitment to securing a fair and equitable treaty. Today, the Nisga'a Final Agreement is secure and signs of renewal reverberate throughout the Nisga'a Lands. Gitlaxt'aamiks is situated on the edge of Anhluut'ukwsim Laxmihl Angwinga'asanskwhl (Nisga'a Memorial Lava Bed Park), the site of Canada's last volcanic eruption. Sport fishing, back country recreation, and cultural tours are available (in season). Visitors from around the world come to experience Wilp Si'ayuukhl Nisga'a, the legislative assembly of Nisga'a Lisims Government. Local stores serve the community and Bed & Breakfast accommodation is available in Gitlaxt'aamiks and other Nisga'a villages. Nisga'a Highway 113 paves the way for ease of access to Gitlaxt'aamiks and the rest of the Nass Valley.